TWO children under eight were rescued by neighbours as flames tore through a Dartmouth Park flat on Monday night in a suspected arson attack. The pair, a brother and sister reportedly aged four and seven, were led through neighbouring flats after escaping along connecting balconies at the block in Chester Road. A man and woman were still in the fourth- floor maisonette when fire crews arrived shortly after midnight. They were rescued from the flat by firefighters wearing breathing apparatus. One Chester Road resident said: “There was smoke pouring out of the upper floor of the flat and the two children were let down onto the balcony. I think he [the male occupant of the flat] let them down with a ladder. 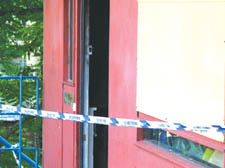 The blackened entrance to the council flat, at the rear of the block opposite Highgate Library, was under police guard throughout Tuesday, while police and fire brigade gathered evidence. * A 35-year-old woman was charged with arson yesterday (Wednesday) at Highbury Corner Magistrates’ Court.